After three days of competitive racing, St. Thomas’ Peter Corr’s Blitz, a King 40, won six of seven races to dominate the Racing I Division in the 46th BVI Spring Regatta, that wrapped up on Sunday, after doing the same in the St. Thomas International Regatta last weekend. Besides Corr, the BVI’s Chris Haycraft and St. Thomas’ Fritz Bus pulled out narrow division victories. 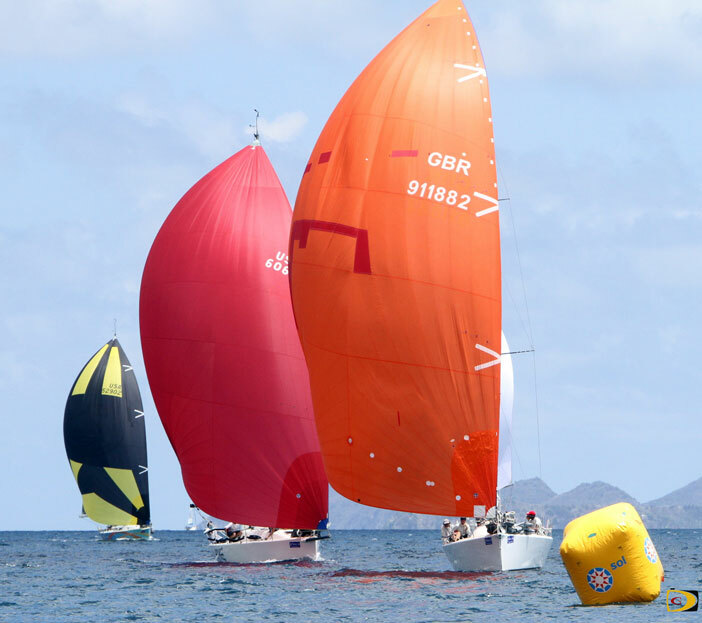 Racing Division 2 had the regatta’s closest finish, with the BVI’s Chris Haycraft’s Pipedream edging Great Britain’s Tony Mack Beneteau First 40, Team Fly Joana by ½ a point, 20-20½. After five races, Mack was in control of the division with 9.5 points, but the battle began heating up in race six. In the IC-24 Class, the seesaw battle between the U.S. and British Virgin Islands Frits Bus and Colin Rathbun, saw Rathbun erasing Bus’ two points 9-11 advantage at the end of day one for a three points 15-18 advantage over Bus heading into Sunday’s finale, after Bus finished fifth in Saturday’s final race—the ninth on the two days. But Rathbun stumbled out the blocks on Sunday and was disqualified and Bus has a scoring penalty in the last race as both settled on 27 points but Bus won on countback with Bus having 5-4 edge over Rathbun in victories. With two victories, John Carrol’s Gunboat 62 Elvis, held a five points advantage over Stephen Cucchiaro’s Gunboat 60, Flow, 2-5, but Jim Vos’ HH 66 Nala, who was one-point back of Cucchiaro, finished second on Sunday to edge Vos 8-9, while Carol secured the class win with another victory. The Jib and Main Division saw the USA’s Jeremi Jablonski Avanse, a Hanse 43, nursing a three points lead over the BVI’s Keith LiGreci’s Girasoli, a Jenneau 38 Oddesy, 7-10. Both had leap frogged early leader Peter Hobs and Sarena Alexander’s Sigma 38, Sam of Hamble who had 13 points. A fourth place finish in the final race put LiGreeci further back, solidifying Jablonski’s class win with 9 points. Just three points separated the C&C30’s, heading into the final day of racing. Julian Mann’s Don’t Panic, with BVI’s Alec Anderson aboard, sat on a one point, 12-13 splinter over Trey Sheen’s Nemisis, who was two points ahead of Walt Thirion, Themis’ 15. Man’s second place finish in the last race gave him the victory with 14 points. St. Croix’s Joe San Martin, racing in CSA-Multihull, the Teegull 2300, Piglet, put up all picket fences to secure the division. In the bareboat class, the USA’s Bob Beltrano’s Sunsail 44i NALA, won four of the five races to seal the division ahead of Presley King’s Sunsail 44i, Team Sunsail, 6-9.